Bun’ Ber E Celtic Bands has no control over the content of material accessible on any sites cross-referenced with our site. It accordingly is the responsibility of the Internet user to make his/her own decision about the relevance or accuracy, currency and reliability of information found on those sites. Unplugged is available for digital download! Subscribe to our e-newsletter for more updates. with plenty of traditonal favourites given the Bun' Ber E treatment and the irresistably cheeky "Heart's With You". Try before you buy at MP3tunes.com - where each track costs just US88c and the full album just US$8.88. You can use any media player or burn them to CD. "... the Queensland sun certainly shines through your music! This is Celtic Folk with a warmer flavour that you'll hear in most other parts of the world - with plenty of fresh sounding material. 'Fresh' in that it doesn't get covered by a lot of other bands... Plenty of the so called 'forgotten' music here... Well done!" - Glen Clifford, Celtic World Radio Program, ACT. I had another great Sunday listening to your wonderful music. Then to come home and listen to Unplugged, it just blew me away. I have waited a long time for your new CD and it was worth it. Keep up the great work I hope you realise the extreme pleasure your music is creating. - Fondest Regards, Ken Seeley. Order Unplugged now for US$10 each plus US$3.75 postage and packaging! Order and pay on PayPal and we'll send your order as soon as the order clears the banks. Paypal prices are in US$. If you would prefer to send us a cheque in AUS$, please Click here to generate an e-mail and order as many copies as you like. Better yet, order one copy of Bun' Ber E Unplugged and get a copy of Ceilidh for just US$7.50 more! That's two CDs delivered to your door for just US$21.25. In addition, we'll honour any order received by e-mail. Tell your friends about this offer. 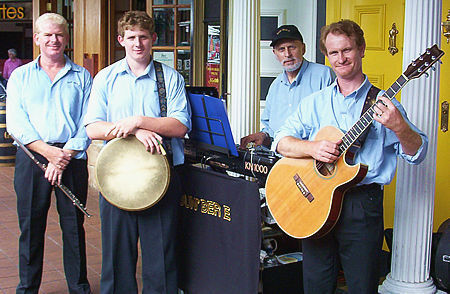 The fun-loving boys of BUN’ BER E play Celtic music throughout Brisbane and much of the surrounding area. We play traditional and not-so-traditional Celtic music, including Irish, Scottish, and of course Australian Folk Music. Ceilidh merchandise now available! Click here for shirts, drinking vessels, fluffy toys and more. Made in the USA and shipped direct to your door. Bun Ber E's CDs, Ceilidh and Unplugged, are available from CDBaby.com and their tracks are also available for download from MusicNet (AOL users), MSN Music, QTRnote, Mperia, MP3tunes.com, NetMusic, BuyMusic, Sony Connect & Apple iTunes, AudioLunchbox, Rhapsody and RuleRadio (who have handed it to college radio station WQFS). It will soon be available from Weed, MusicIsHere (under construction), DigiPie, Napster (USA only), MusicMatch, Puretracks (Canada only), and eMusic. This website is copyright © 2003-06, Bun' Ber E.